House Judiciary Committee chair Jerrold Nadler said Wednesday he is "disappointed" that the attorney general won't meet an April 2 deadline to submit the full report. WASHINGTON — House Democrats on key oversight committees are exploring legal options, including the possibility of subpoenaing special counsel Robert Mueller, if the Justice Department fails to meet their request for a full accounting of the 22-month investigation into the 2016 Trump campaign and Russian interference, according to three lawmakers involved in the discussions. Sending a subpoena straight to Mueller — possibly bypassing Attorney General William Barr, who was in charge of the special counsel’s office and provided a four-page summary of Mueller’s report to Congress — is one of several options Democrats are considering as they seek to obtain the full report. The Democrats spoke on the condition of anonymity because they were not authorized to disclose private conversations. Barr’s summary, sent to Congress just two days after he received the Mueller report, said the investigation did not find evidence the Trump campaign had conspired or coordinated with the Russian government. Separately, while Mueller's report "did not draw a conclusion" about whether President Donald Trump had obstructed justice in the investigation, "it also does not exonerate him,” Barr’s memo said. The summary, in which Barr effectively clears the president of wrongdoing, has emboldened Trump and his GOP allies. Democrats, meanwhile, are demanding the full report and the underlying documents Mueller obtained during the course of his work — putting a potential Mueller subpoena on the table. House Democrats on Tuesday set an April 2 deadline to receive the full report. But House Judiciary Committee Chairman Jerrold Nadler, D-N.Y., said Wednesday afternoon that Barr had informed him he will be unable to meet that deadline. Nadler said he was "disappointed" and reiterated that the April 2 deadline "remained firm," even though the attorney general said a fuller report would be provided in "weeks, not months." “This report did not exonerate the president,” House Majority Leader Steny Hoyer, D-Md., said Tuesday, noting the unanimous and bipartisan House vote earlier this month for a resolution calling for the report to be made available to the public and Congress. “If that is not forthcoming, we will certainly consider subpoenaing not only individuals involved but also records and papers and transcripts,” Hoyer said. After Barr's summary was released Friday, House Intelligence Committee Chairman Adam Schiff, D-Calif., told CNN in an interview that if the Department of Justice does not hand over the full report, "we will have to subpoena the evidence, we will have to subpoena Mueller or others to come before the Congress and answer questions." Democrats involved in the oversight process say they recognize that subpoenaing Mueller directly would be a nuclear option, typically done as a last resort. But they say it may become necessary because Barr — Mueller’s boss and a Trump appointee — might not give a full accounting of the Mueller report without heavy redactions. Rep. Ted Lieu, D-Calif., a member of the Judiciary Committee, told NBC News that if the report sent to Congress is heavily “blacked out,” then “we would be angry and likely pursue other routes,” including a Mueller subpoena. Democrats say there is recent precedent for such testimony, pointing to then-FBI Director James Comey’s testimony before the House Oversight Committee in 2016, days after declining to prosecute former Secretary of State Hillary Clinton over her private email server. In that case, lawmakers didn’t pursue a subpoena but bypassed Comey’s boss, Attorney General Loretta Lynch, to speak to Comey directly. Still, bringing Mueller before lawmakers could have its own limitations. 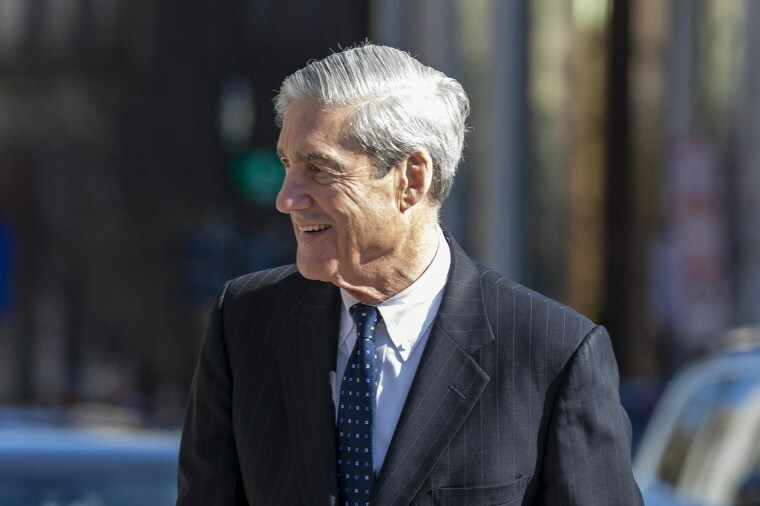 Lawyers for Judiciary Committee Democrats warned members in a conference call Monday night that Mueller could be limited in what information he could provide to them, since he still technically works for Barr. Also, all of the Democrats interviewed said obtaining the report is a crucial step before any testimony. The lawyers also advised that Mueller does not have the authority to produce the report since he is no longer the custodian of it. Barr now controls the report and access to it. “Barr could permit Mueller to testify but it doesn’t mean Mueller will be permitted to answer every question,” said Chuck Rosenberg, a former FBI and Justice Department official and MSNBC contributor. While Barr’s summary stated that Mueller had found no evidence Trump conspired with the Russian government, Democrats want to know if there is additional information about the nature of the president’s relationship with Russia or wrongdoing that doesn’t rise to the level of criminality that should be made public. Justice Department officials have told NBC News they need time to scrub the report to remove classified information. Much of the evidence Mueller gathered came from grand jury testimony, which by law is protected from being publicly disclosed. Barr is also limited from releasing evidence that may still be used in prosecutions that have spun out from the Mueller probe. Democrats say they have a strong case for going directly to Mueller — specifically the Comey testimony in July 2016. Comey announced on July 5 of that year he had chosen not to prosecute Clinton for her use of a private email server as secretary of state. But he then gave a lengthy press conference citing her missteps, calling her “extremely careless” in handling classified material. Despite that press conference, which gave ample political fodder to Trump and his Republican allies, then-House Oversight Committee Chair Jason Chaffetz demanded an emergency hearing with Comey to testify, effectively going around Lynch. Republicans at the time argued that Lynch, who had met briefly and privately with former President Bill Clinton on an airport tarmac weeks earlier, was too conflicted to testify. Comey appeared before the committee on July 7. Among the questions Democrats believe must be answered is whether Mueller actually intended for Barr — not Congress — to make the call on whether the president had obstructed justice, a question best posed directly to Mueller. Caroline Fredrickson, president of the American Constitution Society, testified before the Judiciary Committee on Wednesday, saying that it was “quite unprecedented for the attorney general to assert himself in this way,” referring to Barr clearing Trump on obstruction. Presidents have faced allegations of obstruction of justice twice before in recent history — Bill Clinton in 1998 during the Monica Lewinsky investigation, and Richard Nixon in 1974 during Watergate. In both instances, special prosecutors in charge of the cases turned over evidence they had gathered to congressional impeachment inquiries. Although the Nixon special prosecutor, Leon Jaworski, made his evidence available only to the Judiciary Committee. Mueller, under the more restrictive rules now governing a special counsel investigation, is not authorized to send material directly to Congress. The main consideration for Democrats is how forthcoming Mueller could be in either an open or closed hearing. Separately, Nadler is in talks with the Justice Department about a date for Barr to testify to his committee. Barr is set to testify before the Appropriations Committee on April 9 on a separate matter, offering members of that committee an opportunity to grill him on the Mueller report if they wish. Barr’s decision to characterize the report without providing any details to support his conclusions “was a public relations masterstroke” that has allowed Trump to set the narrative, said Rep. Jamie Raskin, D-Md., a House Judiciary Committee member. “We are probably going to have to use every tool available” to obtain the report’s most critical takeaways, he said. Alex Moe, Ken Dilanian and Julia Ainsley contributed.